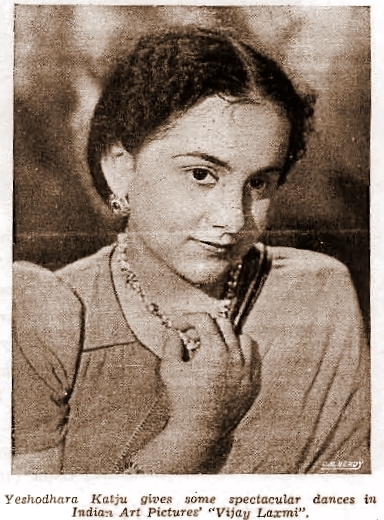 In 1941 when Pandit Nehru's young niece decided to join the film industry not only did Yashodhara Katju become the first Kashmiri heroine of silver screen but perhaps one of the first woman from a good family to set foot in the not so good film industry - an event that was certainly newsworthy. From FilmIndia Magazine collection generously shared with me by Indian film enthusiast Memsaab who runs one of the best blogs on Indian Cinema. Fourteen year-old Yashodhara Katju comes from a famous family of Kashmir Brahmins who have settled in the United Provinces for generations. Well connected by ties of blood and friendship with some of the leading families of U.P. Yashodhara is at present studying in the Senior Cambridge class and in addition happens to be an accomplished dancer, having taken an extensive training under some of the best dancers in the country. She is reported to be a fine exponent of the Manipuri and Kathakali schools of dancing. Her first screen role is likely to be in “Roti” a social picture directed by Mr. Mehboob for the National Studio. Interestingly, right next to that news-piece was an ad for Afghan Snow cream. One of the biggest name in beauty creams in India right until the 1970s.